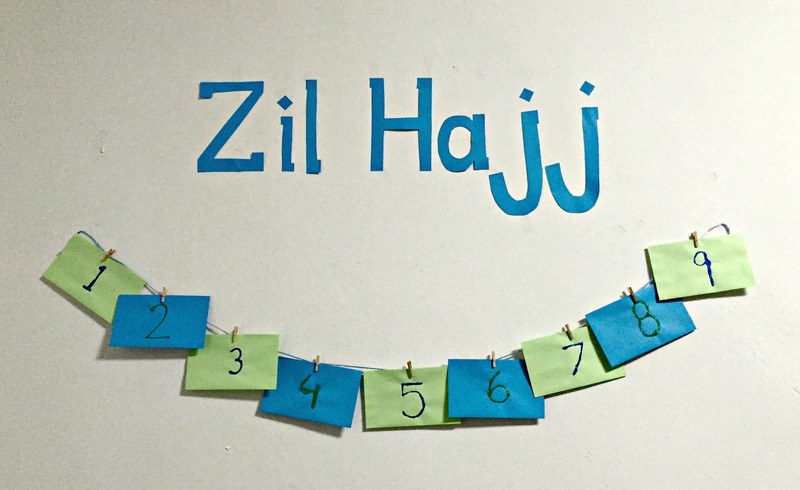 Zil Hajj is fast approaching! Millions are going for Hajj, while those who are at home pray that we are able to travel to the Holy Kabah soon. May Allah bless us all with the opportunity! While we are at home, however, I want to make sure to talk about Makkah, Hajj, and this Eid as much as possible. I feel like this Eid does not receive as much attention and excitement as Eid-ul-Fitr – and my goal is to change that! I have come up with activities to discuss all of these aspects in the 9 days leading up to Eid-ul-Adha. When I was in Makkah a few years ago, seeing the mountains and the streets and the mosques, I kept thinking of this nasheed by Zain Bhikha. In this nasheed, Zain Bhikha talks about how the mountains of Makkah have been around to witness so much history. We hear so many stories about the events that happened in Makkah, from the time of Prophet Ibrahim (AS), from the time of the Prophet (SAW), throughout history. We know about Prophet Ibrahim (AS) building the Kabah, we know about the birth of Imam Ali (AS), we know about the army of Abraha and how Allah protected the Holy Kabah. The mountains have been a witness to all of this. Discuss what the kids know about Makkah. We have heard many stories from the time of the Prophets, of the Imams. Talk about what they know. Create a list of events that they know. Include the events that are in the Nasheed. Cut the list apart, separating each event. Download story HERE. For older kids, have them read it. For younger kids, have a discussion, based on their knowledge level. 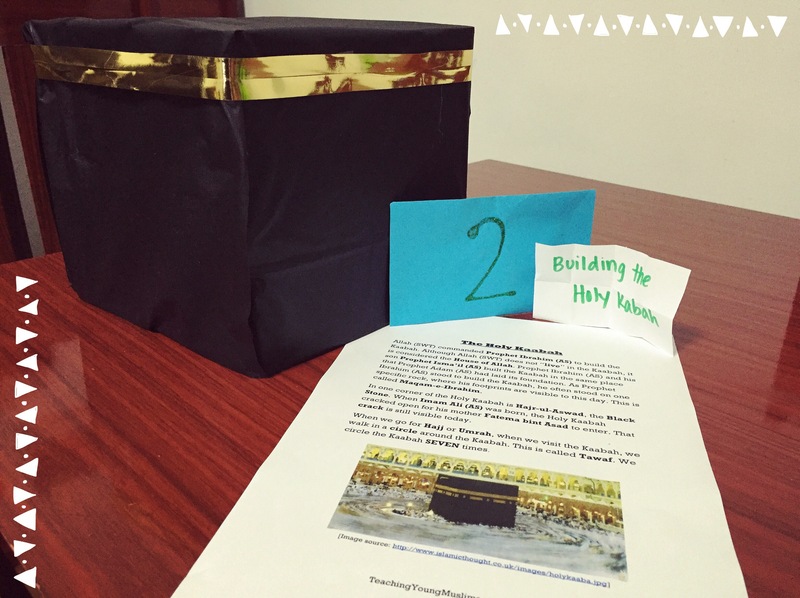 A classic activity that is found everywhere, but honestly, I’ve never made a mini-Kaabah before. I felt like this was the perfect time. 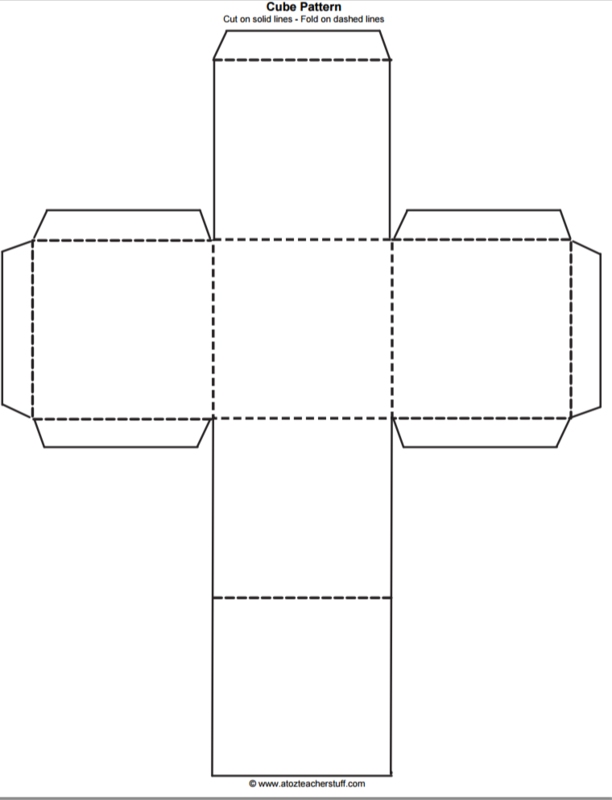 Cut and fold the black paper using the cube template to make a cube shape. 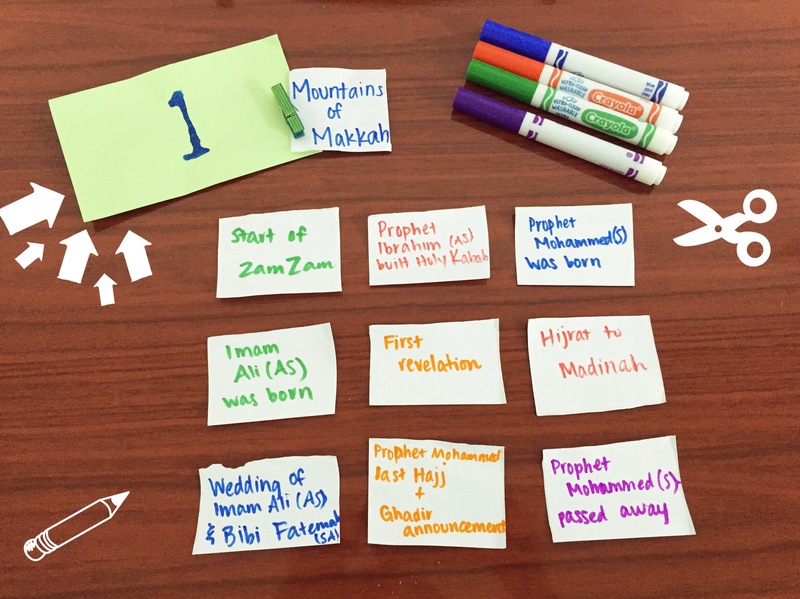 Decorate the Kabah using the ribbon and the marker. 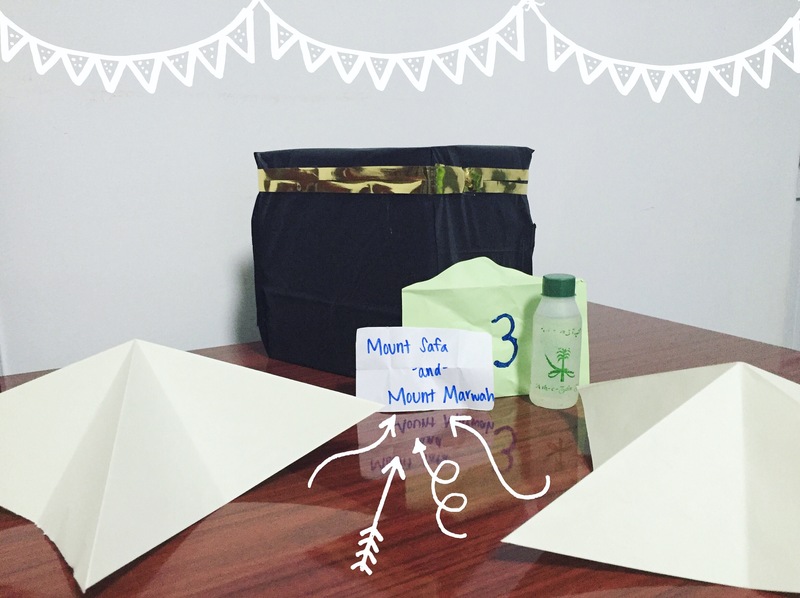 To go along the previous activity – build mountains to add to your Kabah display. Cut out and fold the brown papers using the cone template to make a cone shape. Label one mountain Safa and one mountain Marwah and arrange the mountains with the Kabah. Activity: Drink Zam Zam water! If you have some, drink Zam Zam water. Fill in the fluffy part of the sheep by gluing cotton balls. Once the sheep dies, color in the surrounding areas. 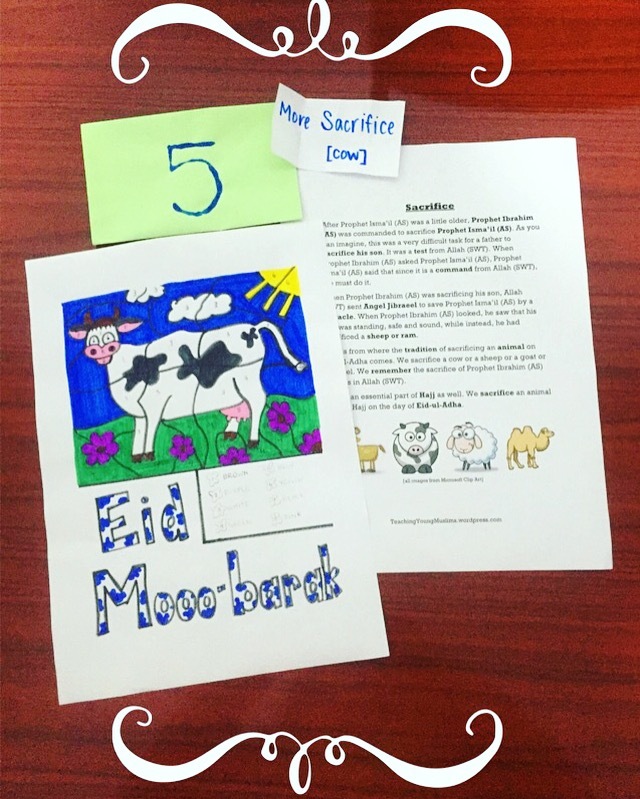 Decorate the page to make an Eid sign. Revisit the story from yesterday. Have a discussion about the animals that we sacrifice on Eid-ul-Adha. When we sacrifice the animal, we should give a portion to our relatives and neighbors and a portion to people who are less fortunate. Living in western countries, we often cannot participate in this tradition. Because of this, people often give money so that people in need can sacrifice an animal. Color in the areas of the cow based on the numbers. Each number corresponds to a color. 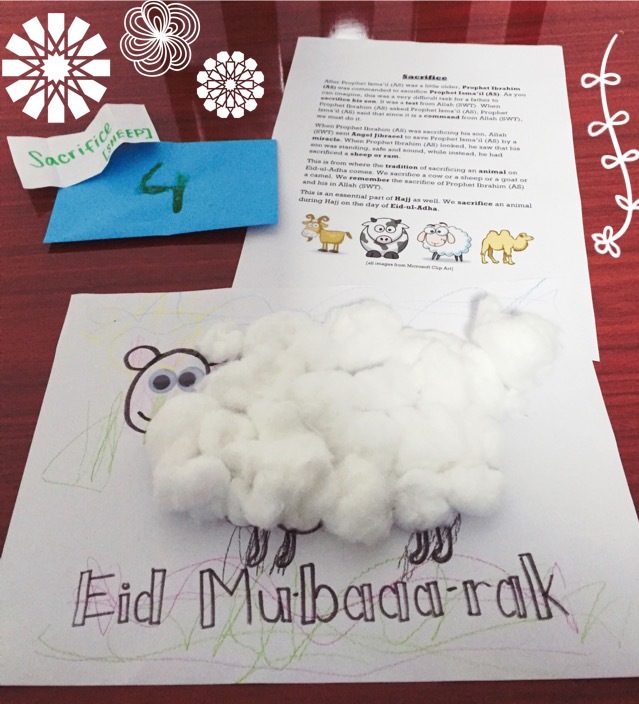 Decorate the rest of the page to make an Eid sign!